Jack Kirby never met an idea he didn't like well enough to use twice. Poe hinted at that when he compared Kalibak to Blastaar, but that's certainly not the only case. Kirby leaves DC and can't do his New Gods any more? Here come the Eternals. Moving off Captain America? Slap a blue suit and a shield on someone else and call him the Guardian. And while we're at it, why not surround him with a rehashed copy of the Young Allies? 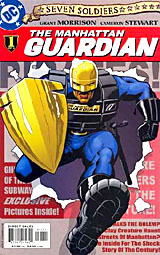 Jim Harper was an ordinary rookie cop when he donned a costume, took up a shield, and became the crime-fighter known as the Guardian. He soon found himself battling alongside the other costumed crime-fighters against larger-scale menaces. 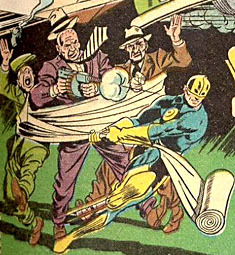 But he took on his greatest responsibility when he became the leader of the youths known as the Newsboy Legion. They helped him fight injustice, and he helped them finish their homework. 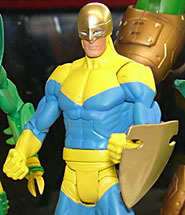 It's kind of an idiotic move to release Guardian in DC Classics Series 9. After all, they just put Dr. Fate in Series 8, and other than Fate's cape, the two are (for all intents and purposes) visually identical. Same gloves, same boots, same trunks... hell, in 1942 Dr. Fate ditched the cape and changed his helmet, so the only difference between the two was an amulet. How is it at all smart to have these guys in consecutive series, when they might end up competing for attention and confusing buyers? Guardian uses the slender male body, with no new sculpted parts. He does have a thick belt, but it's a separate piece between the halves of the body. There is absolutely nothing of note in the sculpt of Guardian, and not even the "First Time in 6 Inch!" sticker on the front of the package can generate any excitement about this dull-as-dishwater offering. How awesome would it have been if they'd done the Manhattan Guardian, from Grant Morrison's Seven Soldiers miniseries? Oh well, at least he can still look down, unlike a lot of DCU figures. On the other hand, the sculpt of his head is absolutely wonderful, with a real feeling of depth that makes the helmet look like something the character is wearing rather than a part of a plastic toy. Guardian originally wore a completely average construction hardhat, but that eventually shifted to the sort seen here, which comes down over his eyes. The eyes actually appear to be behind the mask, not just sculpted into it. Great, great work! Guardian has one accessory, and it's the one he needs: his shield. Like a lot of early superheroes, Jim Harper was a policeman in his civilian life, so it's appropriate that his shield actually looks like a shield - a policeman's shield that is. You know, a badge? It's mostly round, with a horizontal bar across the top. The straps on the back are plastic, rather than elastic. Why? Maybe it was cheaper. It definitely means the shield grips the arm tightly, so consider it a benefit, not a flaw. Overall, the paint looks very toyish - flat blue and bright yellow just don't look great on these figures. At least he doesn't have an ill-conceived gold variant. Well, he was supposed to, as revealed at NYCC '09 and shown in ToyFare, but it was cancelled because Mattel claimed they didn't have tooling available to do both and the vintage version was further along in the process. Of course, since the only "tooling" difference is the shield (not exactly a high-priority change), that sounds like the sort of untrue excuses we were so often spoonfed. The set also includes Chemo's right leg, the partner to the piece included with Black Adam. Once again, it's huge, translucent green and huge. Yes, we said huge twice. Big metallic foot, joints at the ankle and knee, all the same stuff. Can't wait to get this BAF put together! Poe predicted that Guardian would be a pegwarmer, but that's pretty much the fever dream of a laudanum-fueled madman. How can something hope to be a pegwarmer when the series it's in is rarer than hen's teeth? Series 9 is just as poorly distributed as Series 8, and it's hard to have a pegwarmer when most stores seem to have gotten in a solitary case (if that), and all the figures disappeared within days. Or hours. It's no surprise Guardian would be the last to go, being completely unremarkable in almost every way, but that hardly makes him common.